Many of you know my intense devotion to Duran Duran that has spanned nearly 3 decades of my life. With the new year approaching fast I have another reason to love Simon, John, Roger Nick and Andy....Why yes, I do remember their names!!! I was listening to some of my favorite 80's tunes while cooking, much to the dismay of my children, when his song came up. "Reach up for the Sunrise" is actually from the 90's I believe and it touched my heart. I've taken it as my new theme for the year. his past year has been....well, shall we say trying. With the birth of a new year brings new life. A fresh start and reason to let go of last year and start again. Several years down the road we will look back and not remember the pain and stress we were under. We will simply remember the survival and success afterwards. At the end of every night brings the sunrise...a rebirth so to say. My goal for 2010 is to smile big, laugh often and love everyone around me. However, my biggest goal is to forget...brush off the negativity from last year and step into the sunshine again. 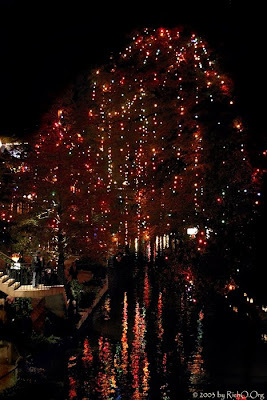 Last night we brought the kids down to the Riverwalk to enjoy the lights. Millions of lights were scattered everywhere. It was beautiful. Unfortunately, we forgot that with it being Christmas week everybody and their brother would be out. However, we found some quieter stretches away from the hustle and bustle of the big city. All right! I confess! I confess! They were driving me nuts!!!! At first everything was great. We were having a great time winding through the Christmas lights and then it started....are we done yet? I'm hungry. I'm so thirsty. So, we did what every self respecting parent would do....we made them walk longer. Tee hee!!! I thought these lights were gorgeous in front of the Westin. Yes, I know I said Westin. They decorated so lovely...It's too bad you can't tell from this photo...the trees are all dead. Yup! Dead. 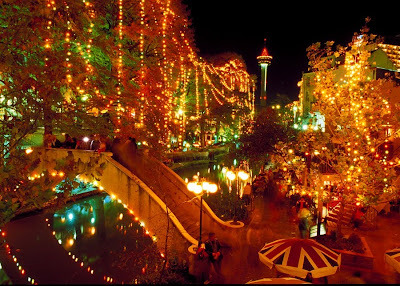 However the lights...beautiful. Hubby and I were having so much fun with their complaints that we walked clear over to the Alamo...Ok! So it was only a couple blocks away. I began falling in love with doors while in Italy. The Alamo was no different. Twenty Flights...Who needs a Stair Stepper?!?! Today was my big day. I returned back to work in the office today as we were touring the new JW Marriott Hill Country Resort & Spa here in San Antonio...I know...it's a mouthful...trying saying it to the guests as they call...Interesting is all I can say. We arrived this morning and within 2 hours I had climbed 20 flights of stairs. The meeting room/ballroom are was 3 flights in itself. All elevators are off right now as it is still a construction zone. We climbed the stairs in awe of the incredible craftsmanship only Heavenly Father can bestow on mortal hands. I fell in love with it. I could live there....just give me the Presidential Suite...it's bigger than my apartment. There are no pools at the resort. It is truly a "Water Experience." Start off at the 3 story water slide and begin your journey down to the lazy river and then onto the fast moving rapids. The kids could spend hours floating from place to place. I fell in love with their handblown glass flowers hanging from the ceiling. Cibolo Moon is the most incredibly beautiful restaurant filled with wonderfully delicious foods...Yes, we tasted. Yum!!! Yes, I'm a Travel Nerd. I fell in love with the resort. What's it to ya?! It's been a week of excitement in our home. Molly has won a contest in the San Antonio area. She was named by Whataburger as the the winner of the Whataburger Winner's Circle. On New Year's Eve, instead of the usual party and merriment we are heading out to watch the San Antonio Spurs play the Miami Heat. Molly arrived home with a package including 4 tickets, parking permit and dinner for all four from Whataburger. We also received isntructions to call and RSVP. We have an appointment...yes an appointment...to arrive at the Alamodome in the early evening and then be escorted out to the court where Molly will get a video taken of her. She will then be escorted to our seats where we will enjoy the game. From there we will enjoy the game including the point where she will be honored by a presentation on the jumbotron and hear the dome cheer for her being inducted into the Winner's Circle. 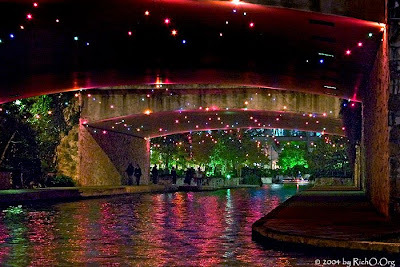 It will be a nice night where we will enjoy spending time together. I am hoping Hubby can be off work that night to get her to the game in time, but if not...I am large and in charge. So our heads are spinning. Last night was our "End of the Year Celebration" at work. It was time to dust off the old party shoes and go out for the evening. It has been our first date night since moving here. Instead opting to stay home and play a game together. It never mattered where we were...as long as we were together. 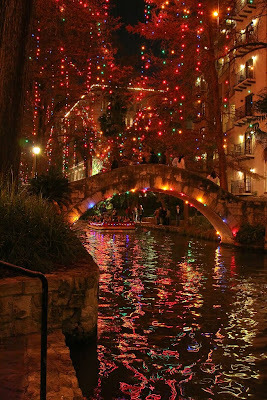 In a semi formal evening we arrived in the Riverwalk in style. We were treated to a delicious turkey dinner with all the fixings and a dessert guaranteed to make you gain 5 pounds just looking at it. And then the festivities began. Hubby finally got a first hand look at the Marriott way. After several items being given away, including HD video cameras, cameras, xbox 360's, several Ipod touches, a Wii and even a 32inch flatscreen HDTV. I didn't win anything, but that's all right. I brought home a beautiful glass cake tray (an exact copy of the one I gave up at the garage sales prior to our move) last week from a different contest. A video presentation had begun by going over the major economic crisis that had hit the US and how people everywhere were losing their jobs and homes. My friends and co-workers each offered a hand of support knowing I had just lived through this experience. And then it was onto our celebration pictures which brought laughter and happiness. Afterwards we danced. We danced and danced and danced. My party shoes had officially become dancing shoes as I left the worries and stress I'd dealt with behind. As the evening came to a close we snuck out silently as we walked outside. One moment...all was well in the world. Thank you for allowing me to have three children in three years. -Though I cried the day I found out I was expecting my third in three years and struggled with depression during those early years to the point where I've blocked out most of my children's toddler years. I didn't have the knowledge you had of the future. You were right. During this latest trial they shouldered the worry, the pain and stress like champions. They refuse to whine about our lot in life and never ask for anything they don't need. They sing happily and hold strong to the gospel and have become and example of pillars of strength for me. I feel so blessed to be their mother. Thank you for allowing me the blessing of losing everything. -Yes, I did day a blessing. You've given me what my heart desired, what I wished for as a child. While other little girls dreamed of doctors or lawyers I chose a man who would love me with all his heart and be loyal and my best friend. I prayed for a man to take care of me and protect me and accept me for the crazy person I've always been. With my husband you've guided me to I can survive anything. Losing everything, it gave me the opportunity to see what was truly important. It is just stuff, the only thing important to me...was my family and friends. Thank you for the blessing of friends. -During the easy times in our lives we go out and have a great time with friends, but when the hard times hit and you are no longer the rock you normally are it is when friends count the most. To have a friend who would call because the message you left didn't sound right. To have friends who threw an absolutely beautiful going away party forgoeing the larger parties and keeping it small to ease my anxieties about being the center of attention. And Most Especially....Thank You for the blessing of my Family. To my family who helped calm me during my times of stress. To those who helped tear down walls and remove nails in planks of over 3500 feet of planks. To those who took out for a final going away dinner. Those who supported me during my garage sales. Those who offered shelter if we couldn't move fast enough. Those who gave my children candy for the drive halfway across the nation and gave me earplugs and aspirin to take care of my needs. It was truly a laugh I needed. And the most important thing I am thankful for is you. I know you love me and my family. I was working...simply doing my job in the land of the Pod People. Pod People you may ask? A friend thought we were a myth and that we did not exist. I'm here to tell you we do. Pod People work in small desks lining the floor of our office with half cubicle walls surrounding us. This day was a special day. I was escaping the world of the Pod People and moving away to a far away land. Truly it was less than 14 miles as the crow flies, but if you were to take buses to get from one point to another it truly became an epic trek home. This trek was much different. I was going almost for good. I say almost because I will go back occassionally. I received a ride home, as we discussed earlier, and set up my computer. Unfortunately, the modem decided it had no reason to work. I spent 7 hours trying to get that dumb modem to work. So the next morning I ran over to our cable supplier and traded in the modem for one that works. Once I made it home and plugged it in I loaded up the modem drivers and was prepared to spend a mere two hours, on my day off, to hook up my system. Our installation was FINALLY complete. No, not the car. It was my computer system going down. Are you kidding me? I hauled the tower back to work...on my second day off to get serviced and fixed. Luckily, I was able to pick it up later that day....Our Techie Matt ROCKS!!!! And then the next day it happened. I rolled out of bed 30 minutes before I was due to work and took and shower...slipped into a pair of comfy sweats. It is the principal of the whole thing, you know. I worked all day and found that working at home was a different experience. I no longer had the sounds fo working reservationists next to me sitting under the watchful eye of our dear sweet manager....I really do adore this woman. Now in the morning I drop the kids off at school and come home and get ready to work. When I am done for the day....I simply unplug and walk away from my desk. I am so thankful to be home and look back at the month of training, month of night shifts, moving to the Resort Desk and now coming home. I see the hand of the good Lord in my life. I see how he has guided me at work and in my family's lives. There is much laughter here at home now and smiles from wall to wall. And thanks go to all of your kind thoughts and wishes. It was a crazy end to the day. I received my computer to start working from home. Unfortunately, I was dependent on a ride to bring my gear home. There were mix-ups and it was solved. I had to wait a little longer, but it didn't matter. I appreciated my dear friend coming to pick me up. We tease each other incessantly, it's a brother/sister thing. It's the norm, but I had to threaten to tape his mouth shut in front of his three sons this evening. "Hi! I'm the poor schmuck she said 'No' to when I asked her to go out with me in high school." Lesson learned: Always carry a spare bit of duct tape...you never know when you'll need it!!! Thanksgiving this year was less traditional than I thought. With being away from family and friends we really wanted this first real celebrated holiday to be something special and spend time with the kids. Oh it was special...that's for sure. Thanksgiving started like any other home. I got up early to stuff and dress the turkey making sure it was ready for the oven. Yup! Just drove away!!! I was actually scheduled to work. Yay me!!! To be honest though, it wasn't as bad as you would think. I was scheduled for a 6 hour shift PLUS I was paid for the day off before Thanksgiving...Yes my friends, I was paid to bake pies and rolls. I suffered...I really did!!! I was out the door before my time was set to start. I came home and finished all of the cooking. Our friend and his new girlfriend and her kids came over. What fun to meet some new people. his girlfriend and I hit it off instantly. Dinner was served right away and we were getting to know each other. After cooking all day I was kicking back with my new friend and enjoying laughter and such. Hubby was in the kitchen "de-meating" the turkey. It is his job after to make sure the bird is picked clean. Our friend Bobby was in the kitchen as well playing with his new Iphone and my Ipod dock. He started playing music back from our teenage years and us girls began laughing as the boys literally sang their rendition of "Every Rose Has Its Thorn," an 80's classic. To top it off Hubby began playing air guitar with a turkey bone. No, this was most definitely not your grandmother's thanksgiving. I was thankful for friends that night. Near or far. New or old. However, what I am most thankful for is the laughter. I mean the type that eminates from deep in your belly and you can't help but let it all out. If this is the way our holidays are going to be...bring them on!!!! I hope you all had a wonderful Thanksgiving and are looking forward to the rest of the holiday season!! !